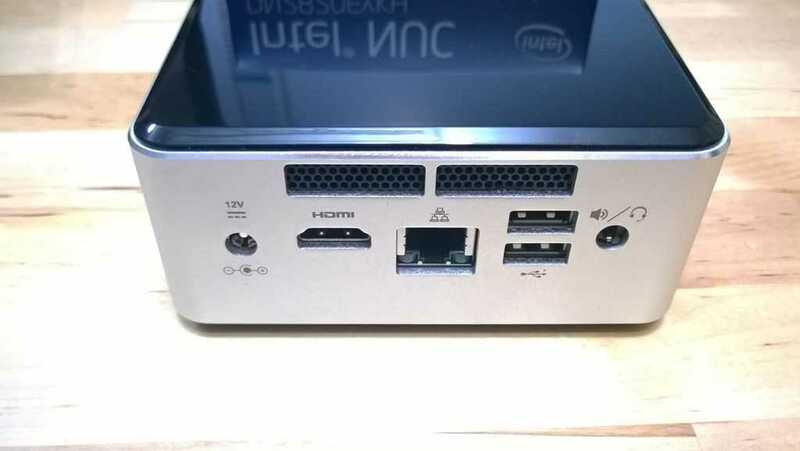 Tag Archive | "Intel celeron"
XBMC, a project that has its roots in original hacked Xbox hardware, is a multi-platform, free software suite that provides video and audio library and playback facilities, a PVR front-end (to software like MythTV that can control TV and satellite cards.) It has a large-screen interface and can be controlled by various remote means including infra-red, app, keyboard and game controllers. It is very network-aware which allows content to be indexed from many sources. Add-on software allows libraries to be enhanced with rich content, fan-art, community information and also allows internet-based content to be access. Podcasts, radio streams, YouTube and many other content sources are supported out of the box. In this article I’m testing the latest ‘Gotham’ releases of XBMC. What’s the difference between XBMCbuntu and Openelec? XBMCbuntu is a complete Linux operating system distribution set-up in such a way that XBMC auto-runs when booted. Standard features of Ubuntu Linux are included which allows the user to run other services (web server, NAS etc.) and to use the desktop in addition to XBMC. Openelec is a very reduced Linux OS that is intended to allow XBMC to run on low-power and small storage PC builds. For example, in this case we’re running Openelec from a cheap USB stick which allows us to ignore the need for a hard drive. There’s little scope for running anything other than XBMC within Openelec. 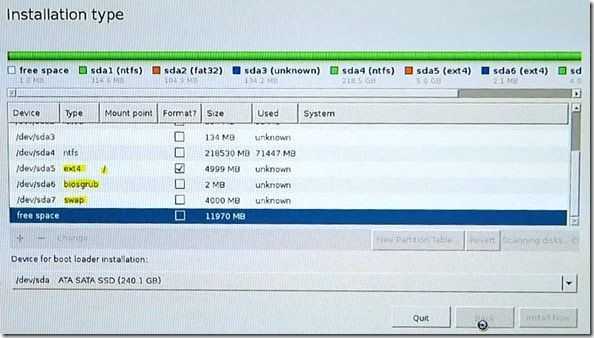 For an XBMCbuntu or Windows 8.1 build I recommend an SSD. 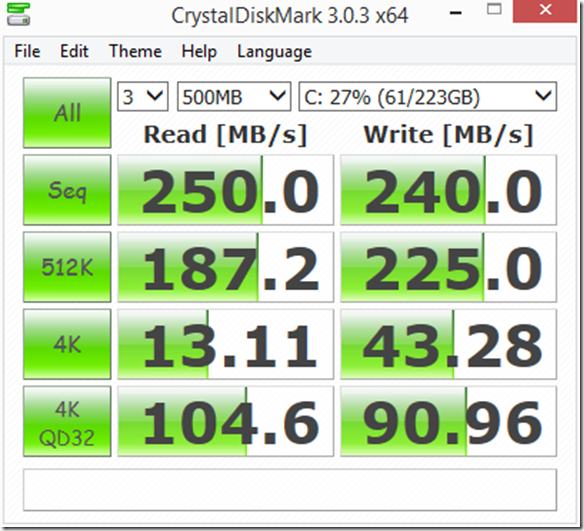 I’m using a MydigitalSSD BP4 240GB part but a 64GB version of this fast SSD is just $60. 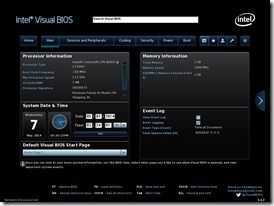 It helps to speed up boot, database updates and to keep power and noise levels low. XBMC install was very simple. A how-to video is shown below. Connect DVD drive to NUC and boot XBMCbuntu CDROM into live image to test functionality. The rest of the install process is self explanatory but on my system – pre installed with Windows 8.1 and using UEFI boot system – it rebooted straight into Windows. I had to reboot, press F10 and go to the boot menu to select to correct boot drive. Having Windows 8.1 and XBMCbuntu on a NUC isn’t likely to be a common scenario but I have it here because of the testing I’m doing. Performance is great. Libraries seem to update very quickly considering the amount of data I have on my remote drives. I used a combination of UPnP from my NAS and SMB shares from my NAS because via SMB I was able to tag the directory a data type and let, for example, a movie database plugin scan all my films and add metadata to them. For audio I used uPnP as I was able to link artists and genres as separate directories. I’m still experimenting with network protocols. In terms of video playback performance I was impressed to see every single one of my Carrypad video test files play. From simple DivX through WMV and H.264 to complex MTS containers with H.264, AC3 sound and subtitles. Videos from the local network all started quickly and I saw no tearing or sync issues. In terms of bitrate performance I saw only one issue with a 25Mbps-30Mbs H.264 fullHD file at 50FPS with Dolby AC3 that was taken direct from a camera recording. During the 90-second video if needed to buffer once so it looks like either some buffering settings need to be adjusted or I need to ensure that my NAS and network is performance correctly. YouTube 1080p performance appears good although I was only able to see 720p versions of most files. 4K content was delivered as 720p despite having the YouTube app set up to request 1080p On my 100Mbps internet connection there were no delays. Other video apps tested: TED, Revision 3, Twit and a few others. I did not test any locally stored content so am not able to give an ‘upper limit’ on, for example, H.264 decode bitrate. No lock-ups or crashes were experienced during the testing period. For the Openelec test I used a small USB stick as the boot media (created automatically using the Live image creator) and a 4GB USB stick as the permanent ‘disk.’ For more details on the installimstall process, which is very simple, are available in this guide. Due to the system running from a relatively slow USB stick I experienced occasional freezing on the UI. In some cases of mapping new content into the system this was 10 seconds or more. In normal playback usage I didn’t experience any serious freezing. Out of the box, so to speak, I had a better remote control experience. A third-party XBOX 360 remote worked although as you’d expect, it turned on both the NUC and the XBOX at the same time. You’ll need to keep your XBOX turned off while you use XBMC! DVDs I tested worked although there were some buffering issues experienced. I’m not sure why but maybe the decrypting process isn’t that efficient? I have yet to watch a full film through so beware that there could be hidden issues that I haven’t experienced yet. DVD menus worked OK.
Video playback performance was good as long as the network could keep up. In my living room I connected via Gigabit Ethernet but saw a few buffering issues with a 30Mbps H.264 file. You’ll have to make sure your routers, switched and NAS are fit for the job if you want to deliver high bit-rate files. This could be an issues for those of you wanting to play FullHD or 4K files made with home video equipment. As with XBCMbuntu I successfully tested a suite of about 20 remote files ranging from low-bitrate to high-bitrate H.264, MPEG-2, DivX, WMV and various containers including MKV files with subtitle content. H.264 encoding seems to be the best solution for high-quality HD content. OpenELEC Stable – Generic x86_64 Version:4.0.0 used for this test available here. 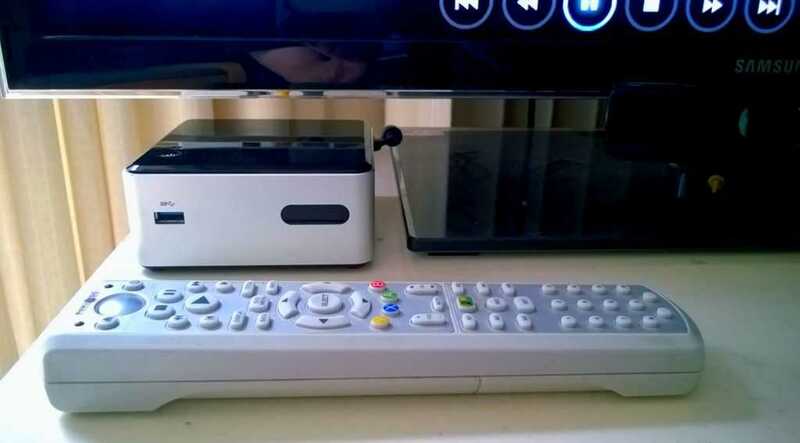 XBMC and the issue with modern digital media. XBMC and other open-source media centers are good for those with a lot of local content but there’s an issue for those that don’t have local films and music and this problem gets bigger as time goes on. Over the last 10 years most of us bought our films on DVD. Recently we’ve started to buy HD films on Blu-Ray too but we’re also starting to use streaming services a lot more. TV shows, music videos and the music itself in these service is almost always controlled via a digital rights management system. While it’s acceptable to make a personal backup of a personally owned DVD in some countries (not in the USA) it’s not permissible to break DRM on streaming content that you rent. In order for pure and DRM content to be accessible via the same program the media centers need to implement closed DRM standards in order to support protected content playback. Unfortunately that’s rare in an open-source system. I know many of you avoid DRM (and for the target audience for XBMC maybe this streaming issue is a non-issue) but it needs to be said so that the average person is aware that XBMC is not a modern all-encompassing digital media player. There are some reasons to have a media center if you haven’t got any local video content. Digital audio files are generally DRM-free and there’s a lot of online video content out there on services like YouTube that could keep someone happy for years but wouldn’t it be better just to buy a Chromecast stick, or similar, for $35? 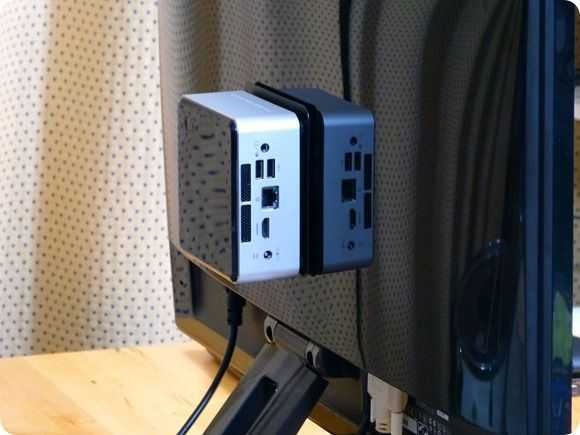 Or how about just connecting your Android, IOS or Windows phone to the TV so you can run whatever program is needed. It’s not a fully integrated front-end but it’s pretty easy to switch apps these days. 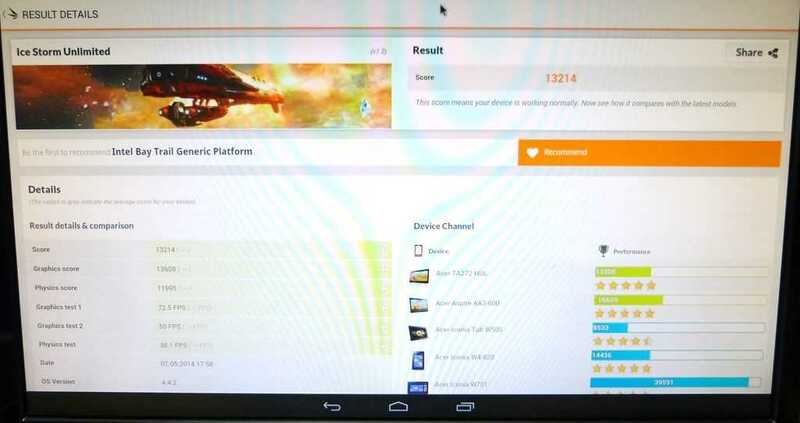 Although I haven’t tested it yet you can even run XBMC as an Android app. Alternative: XBMC / Windows tablet solutions. I seems to me that a hybrid solution is needed to cover all forms of modern digital media and to that end I took a cheap Windows 8 tablet and tested XBMC alongside my music streaming service from Microsoft and my wife’s video streaming services from Amazon. The Windows 8 solution I chose is now available for just $215. The Acer Iconia W4 has HDMI output, can be remotely controlled via a Bluetooth keyboard, accesses the network via built-in WiFi and charges over a USB port. 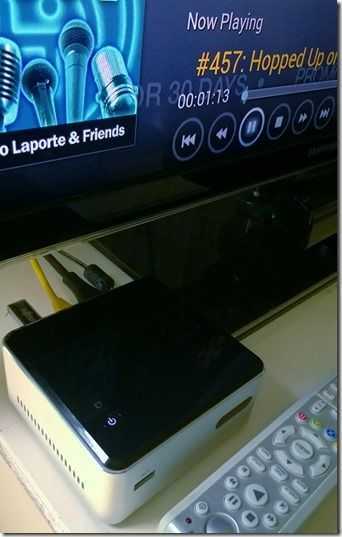 I also tried Miracast wireless display to have an XBMC-in-the-hand experience. 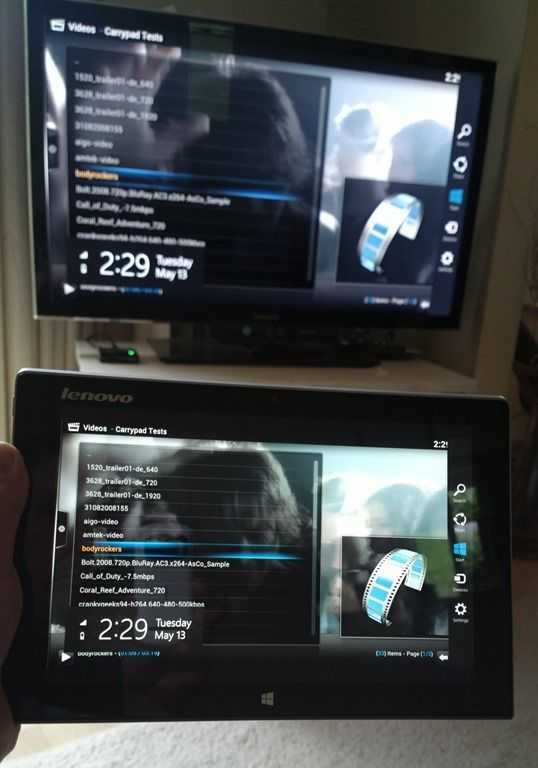 While Miracast is a terrible way to use an interactive user-interface on a remote screen (due to at least 100ms latency) it’s actually possible to use a tablet with a Full-HD screen in mirrored mode and just use the touch UI on the tablet. I tested the Lenovo Miix 2 10 and it worked well and played a 2Mbps film over WiFi. Miracast isn’t good for environments with poor WiFi or for gaming or any other UI-interactive application as the Miracast solution has too much latency for that and I wouldn’t recommend Miracast as a permanent solution. A Windows tablet with HDMI and Gigabit Ethernet adaptor and a remote Bluetooth keyboard is the best way to do the Windows / XBMC hybrid solution. 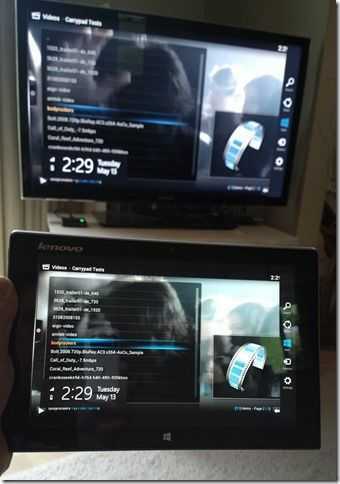 An Android-based alternative could be to use XBMC on a powerful tablet with Miracast capability or to use an Android box. 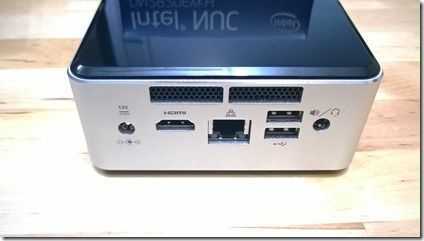 Given that Android 4.4 works on the Intel NUC I have it could be a good follow-up test. XBMC is easy to install on the Intel NUC via XBMCbuntu and Openelec and it makes a small, stylish, quiet solution. Connected via Gigabit Ethernet it’s able to decode 20Mbps+ of remote content. The user interface is easy to control with mouse, touch, remote or keyboard. For the lowest cost solution a fast-USB3.0-stick install of Openelec would be my recommendation and with 2GB of RAM it brings the total cost to around $160. 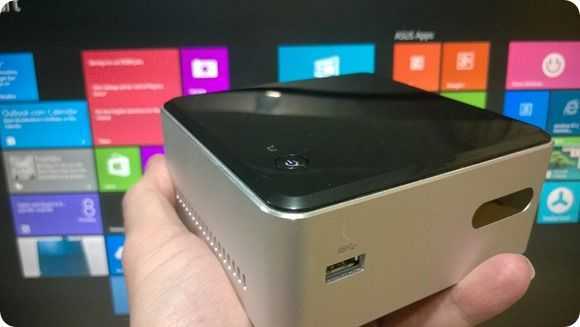 As a hybrid Windows 8.1 / XBMC solution it should do well too and in some respects that’s a better solution for the modern media subscriber. 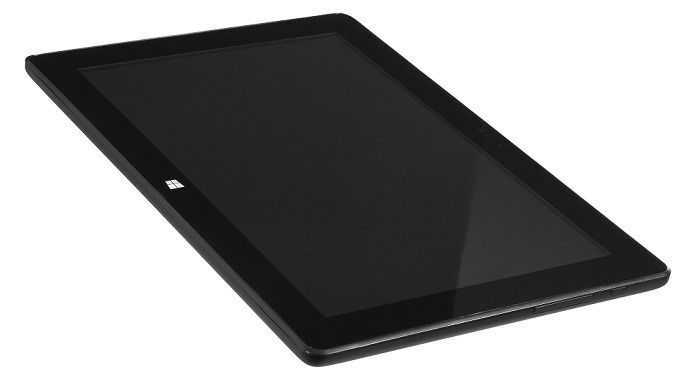 Beware though because disk, memory and license requirements would take the price up into territory where a Windows 8 tablet could perform just as well. I started testing the Intel NUC with Bay Trail-M yesterday and in the post you’ll see some performance figures for Android 4.4. 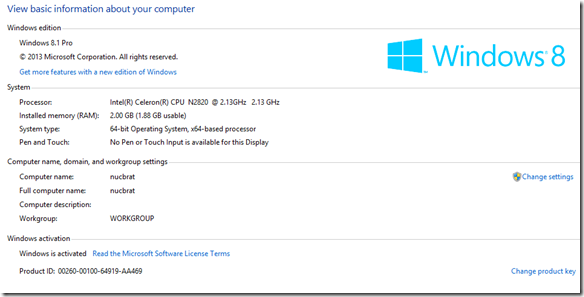 Today I’m looking at Windows 8.1 (Pro) which was a simple, if lengthy, install process. Windows installed correctly from a DVD but a lot of time was taken installing all the (64-bit) drivers. Today I’ve had a chance to go through my usual suite of tests and you see the results below along with some comparison figures. 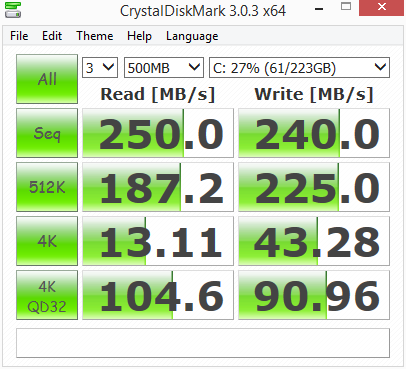 It’s important to note that I’ve gone for a fast SSD drive in the system. 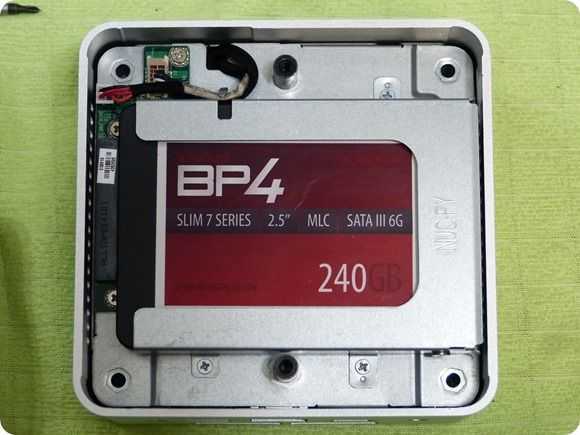 The MyDigitalSSD BP4 I have is a 240GB version but you can pick up the BP4 in a 64GB version for around $60 and it’s something I would recommend because this dual-core Atom CPU isn’t hugely powerful. We’re talking about the CPU and GPU power of an 8-inch Windows tablet here so in order to use this as a desktop PC you really can’t cut corners on storage speed. Oh, and why wouldn’t you just use an 8-inch tablet with a free copy of Microsoft Office? It’s a good question but a SATA disk interface and USB3.0 are just two arguments against that but given that a Windows 8 license is around $100 on top of the, approximately $240 you’ve already spent on the NUC, RAM and disk, if you’re also in the market for a student solution with MS Office you can afford to look at a 64GB Lenovo Thinkpad 8. Buying a tablet isn’t as much fun as building your own NUC though and I suspect that most NUCs won’t end up running Windows. XBMCbuntu or some other free Linux distribution is more likely, especially when you consider the built-in IR receiver. Advertising displays, education, POS and automotive industries (and hobbyist) are also likely to be interested. Having said that, I’m enjoying this Windows 8.1 solution so far. 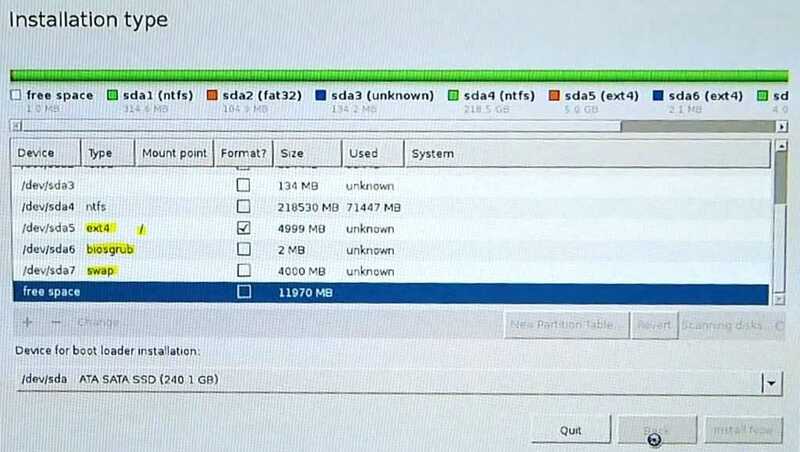 The SATA SSD is making it feel much faster in operation than a Windows 8 tablet and it’s quieter than any laptop once the unit is mounted behind a monitor. The Gigabit Ethernet port is helping to boost internet speeds too. 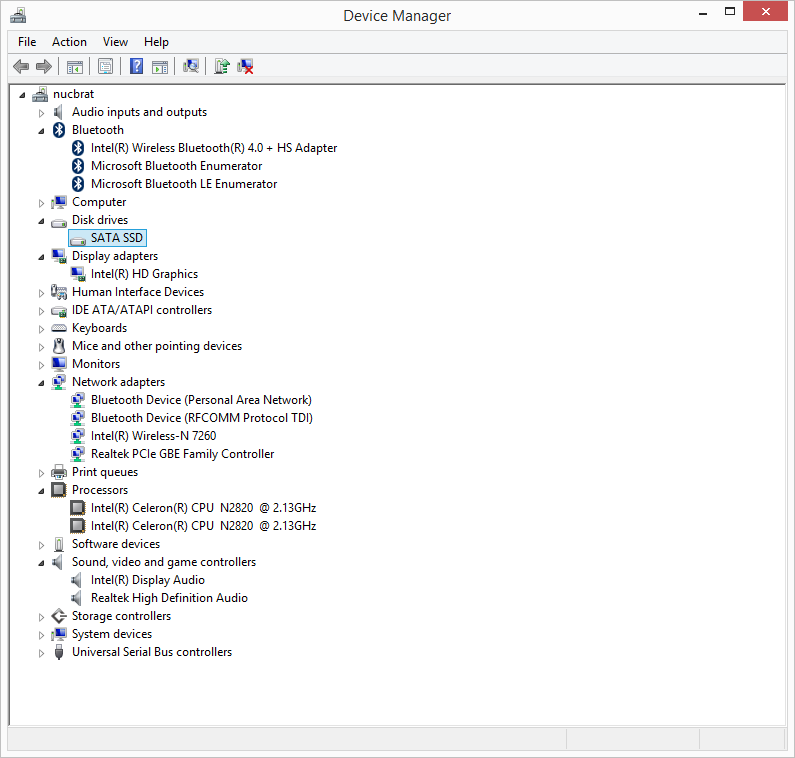 System information and device manager information. In terms of raw power I am a little disappointed. 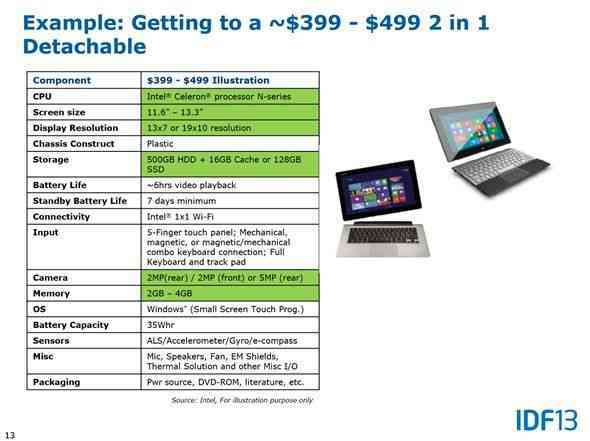 I should know better but the promise of a 2.4Ghz dual-core CPU had me thinking in terms of Ultrabooks and not tablets. It’s good, but don’t get over excited about anything like PC gaming or video editing. On that topic, note that there is no Intel Quick-Sync hardware video encoding so rendering videos could take a long time unless, you have a very very recent (we haven’t seen any in circulation yet) version with the N2830 processor inside. That version does support Intel Quick Sync and should improve basic video encoding performance by about 10X. As mentioned, general performance is OK. 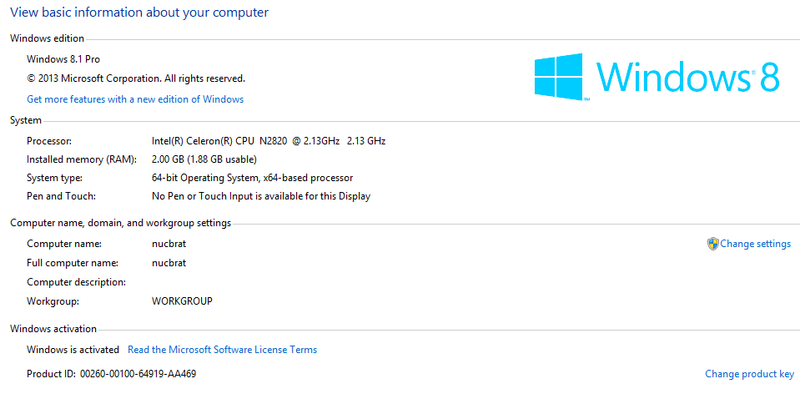 It reminds me of the performance I got from the Acer V5 laptop with A6-1450 CPU after I had done an SSD upgrade. That platform, however, has better GPU performance. 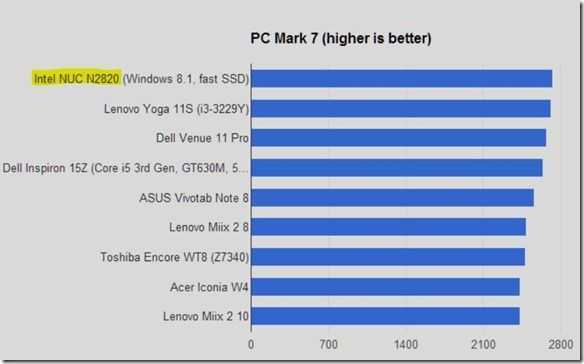 The PCMark7 score was good at 2732 points which safely beats al the Bay Trail-T tablets and even the Lenovo 11S with an Ivy Bridge Y-Series Core i3 CPU. 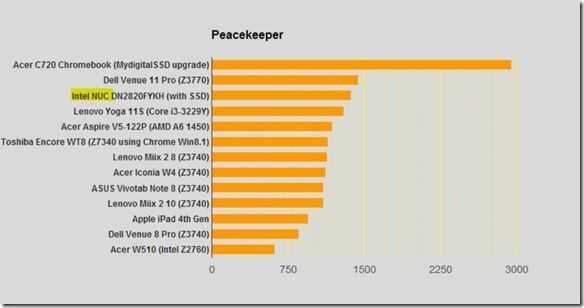 Ultrabooks with recent CPUs and SSDs are getting around 5000 points in this test though and that’s the sort of performance you should be looking for if you’re doing serious multitasking and are looking for a ‘barrier-free’ office PC platform. 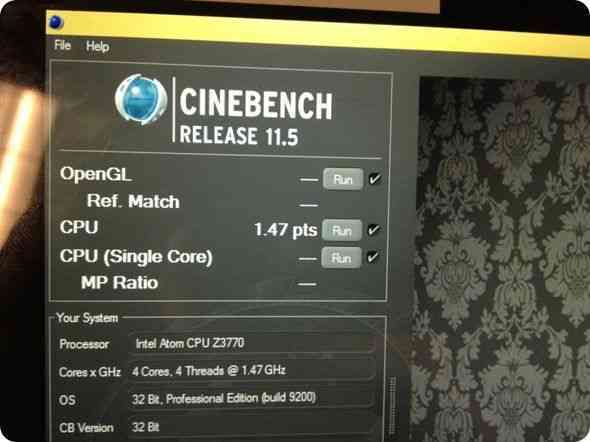 For a raw CPU test we ran Cinebench 11.5 64-bit and saw a rather poor score of 0.83 which is the slowest CPU we’ve tested this year. 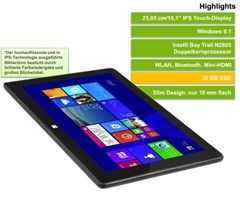 The Z3740-based Windows tablets are showing 50% better CPU performance. 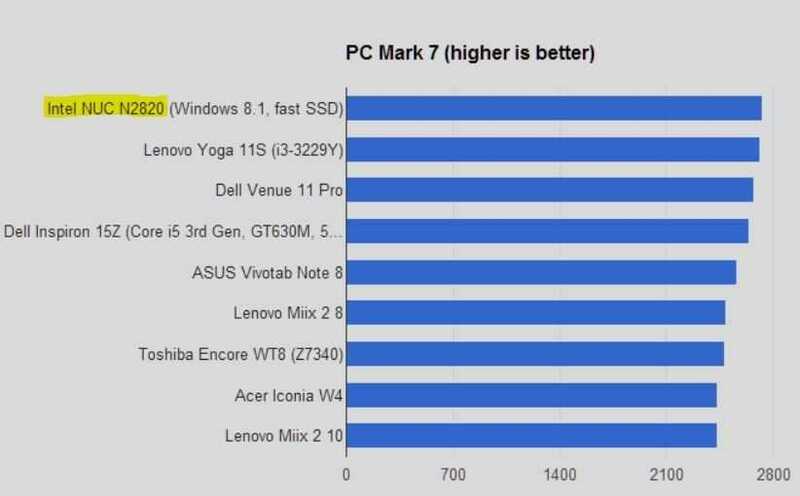 Clearly the SSD is helping to prop-up the PCMark7 scores so if it’s CPU performance you need (excel calculations, software development environments for example) then step away. A 2012/2013 Acer W510 running Clovertrail returned 0.53 points in our review so at least it’s a step up from that. 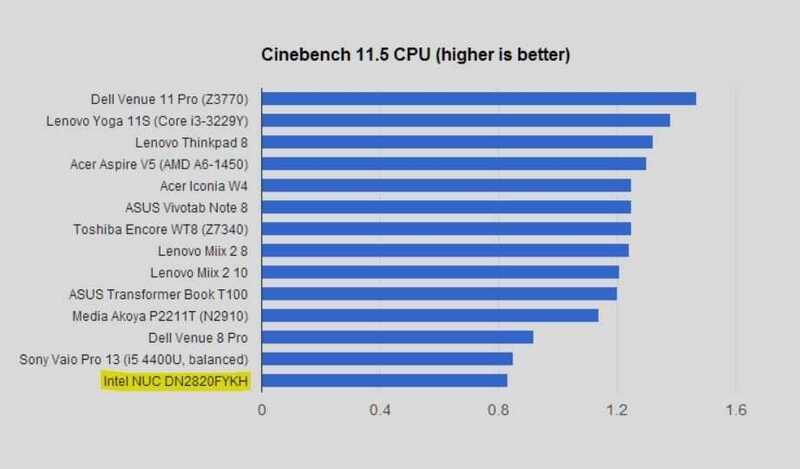 In addition to Cinebench we ran Passmark. 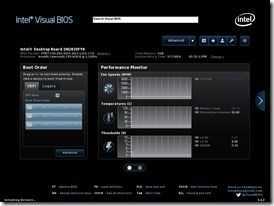 GPU performance is comparable to the Bay Trail-T tablets we’ve seen. The Cinebench OpenGL test returned 6.0 FPS. 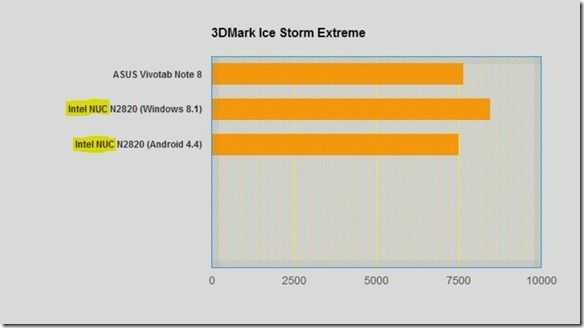 We also ran the cross-platform 3DMark Ice Storm Extreme and saw results slightly above that which we see on the Intel Windows 8.1 Bay Trail-T tablets. 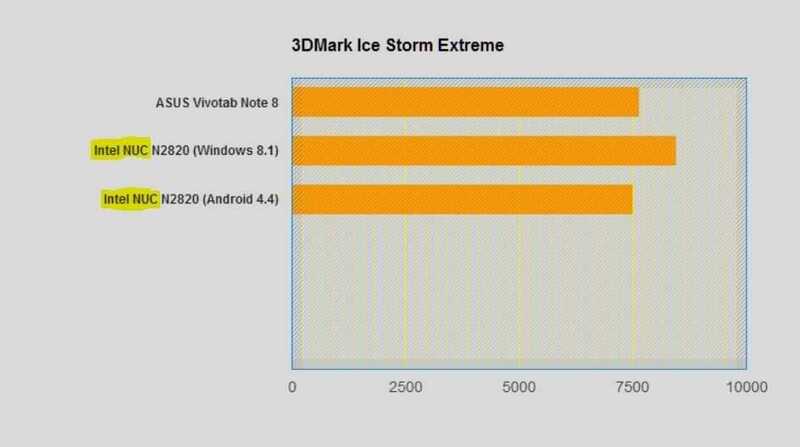 The Ice Storm result on Windows 8.1 was also 13% better than the result on the NUC when we tested it with Android 4.4 although that OS build is still an early one and might need some optimizations. Again, this isn’t a gaming platform but Windows 8 ‘modern’ games did play smoothly. Pinball FX was smooth and responsive on a Full HD screen. F18 Carrier Landing was the same; Drift Mania Street Outlaws too. Browsing speeds are good on the NUC. 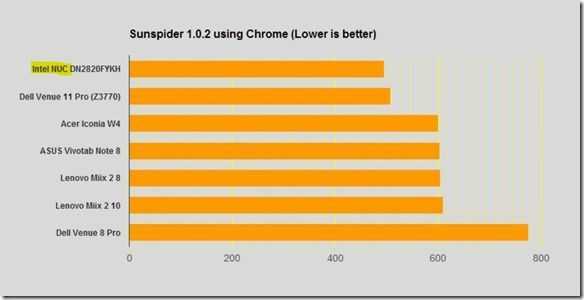 The SSD and Gigabit Ethernet are helping but tests like Peacekeeper and Sunspider show some lead over Baytrail-T devices. 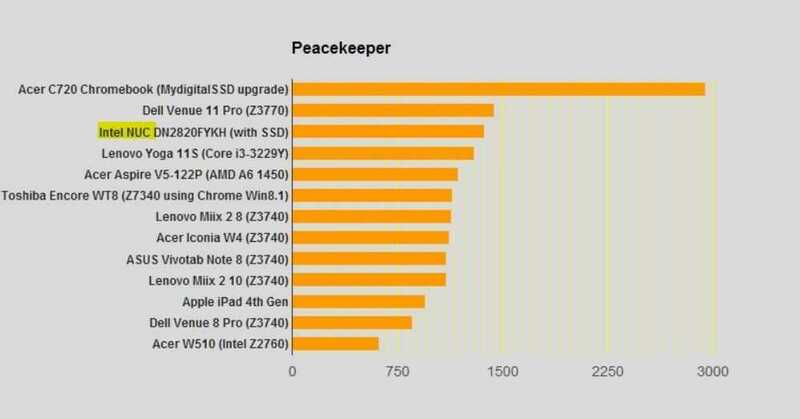 A Sunspider score of 495 beats all the Baytrail-T tablets we’ve tested and a Peacekeeper score of 1374 is good too. It doesn’t come close to the value you get out of an Acer C720 Chromebook though – and that’s cheaper! Finally we come to video performance. In a Handbrake encoding test both with and without Intel Media SDK options turned on we saw under 9 FPS in our test which is truly bad. 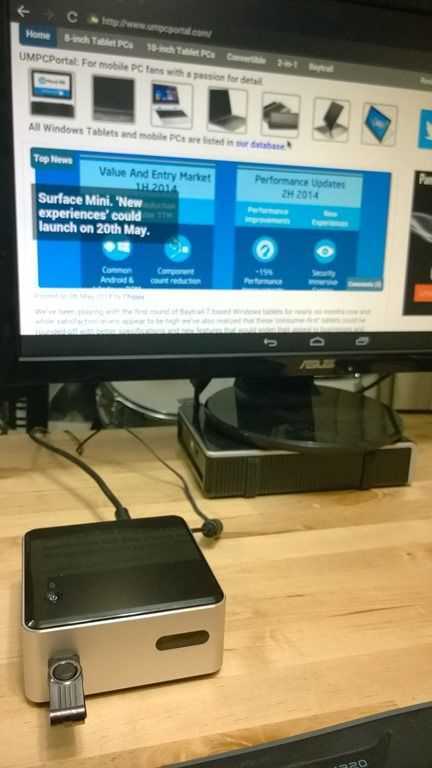 The Bay Trail-T tablets are scoring over 100 on this test and current Ultrabooks score over 300 fps. As for decoding, we played a 50 FPS Full HD H.264 video (30Mbps) through Windows Media Player and saw no problems but a CPU utilization of over 70%. Under Windows 8 Video app, however, the utilization was down to under 20%. Clearly there’s some hardware acceleration going on under Windows 8 modern that doesn’t happen when using Windows Media Player on the Desktop. Playing a 3Mbps H.264 video from a network drive through the Windows 8 Video app resulted in about 6% CPU utilization. A video playback test under XMBCbuntu is probably more relevant for many people thinking about the Intel NUC. We’ll be testing that out at a later stage. We are using a MyDigitalSSD BP4 240Gb unit to test with. Here are the Crystal DiskMark results. As you can see there’s not much to moan about. 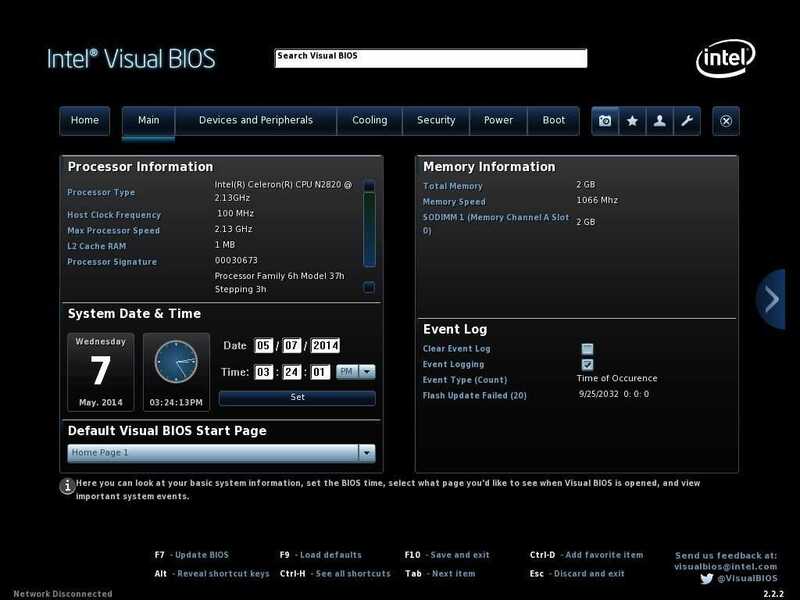 In a previous test with this SSD on an AMD A6-1450 system (here) we saw slightly lower scores. 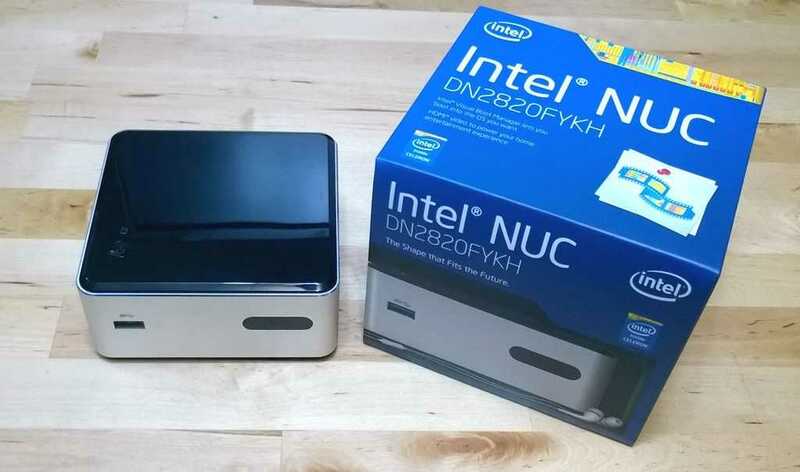 We don’t recommend using this NUC as a desktop with a spinning hard-disk as it will significantly slow down the perceived performance of the system. Idle power used on this platform is so low that it’s not possible to measure it accurately using a consumer ‘Watt’ meter. In our tests it looked like the PSU was actually using 9W of power. We’ll set up a DC-only test at some point in the future in order to allow us to more accurately measure power usage. Noise measurement has proved almost impossible here as the levels are so low. As ambient noise on the workbench is 44 dB it’s very difficult to tell if the NUC is on when mounted behind the screen but there is definitely fan noise detectable if you listen carefully in a silent room. 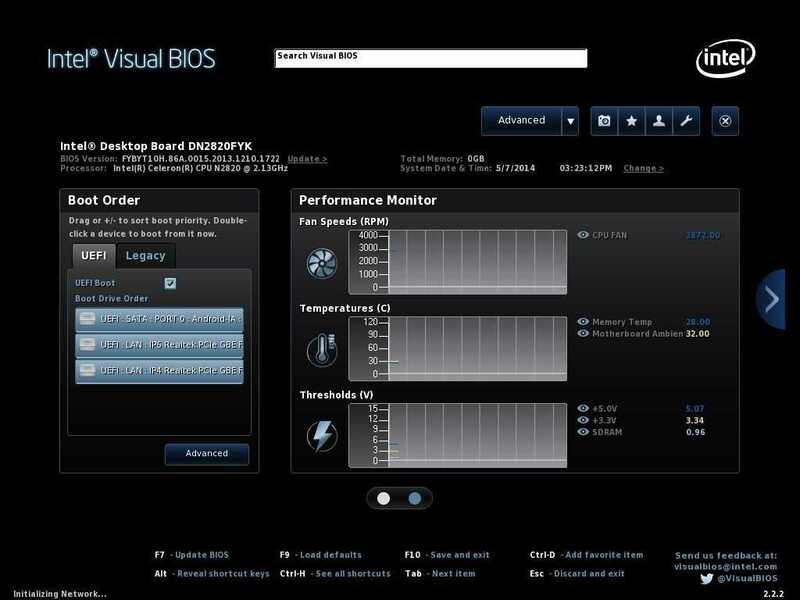 We are running the latest BIOS with default cooling settings and understand from owner feedback that it might be possible to reduce the fan noise through settings available in the BIOS. We haven’t performed tests on the WiFi module or done any audio tests. In a follow-up article we’ll be looking at XBMCbuntu. We’re reluctant to call this NUC an all-round capable Windows desktop PC but there are definitely some interesting use cases here. It’s small and quiet and can support fast SSDs. 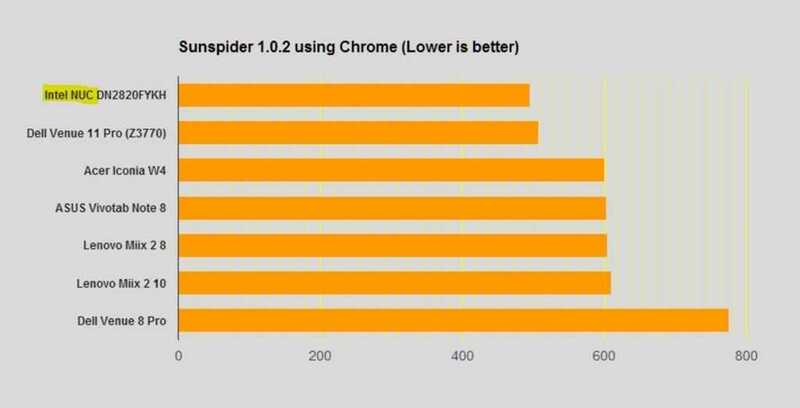 It works well as a video playback unit (assuming Modern or IE is used as the playback environment) and keeps up well with multi-tab browsing usage. With the built-in WiFi unit it’s very portable and could make a useful camping, holiday home or hotel solution. For those thinking of Microsoft Office use cases we would suggest to take a look at the Lenovo Thinkpad 8 which comes with a 64GB SSD, USB3.0, HDMI and Office Home and Student for the same price as a NUC with Windows 8 and the Office license. For those looking for a browsing only solution, you can’t beat the Acer C720 at $220 with this unit. Overall we think that the Celeron N2820 NUC may appeal to those who have specific Windows 8 use cases in mind (data collection, control, advertising, education, kiosk, IoT etc) or for those that have a spare SSD, memory and Windows license lying around. For those wanting a media-center solution, stay tuned. We’ll be looking at XBMCbuntu where we really think this NUC will shine. IDF 2013 Presentation Notes: Baytrail M for Entry Mobile Devices. 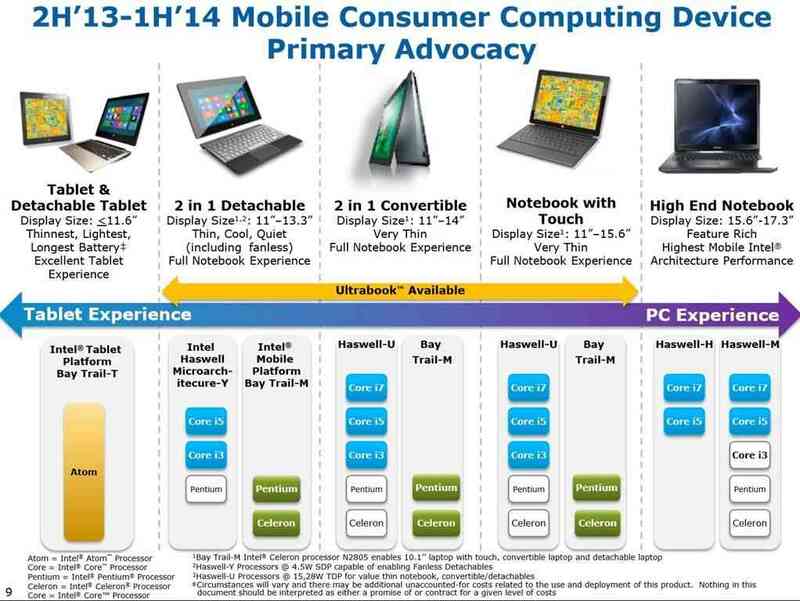 When we think about 2-in-1 tablet and ‘laptop’ designs we have two platforms available. Haswell Y-Series is for high-end Ultrabook-class devices and from today, Baytrail-M Celeron and Pentium-branded platforms. 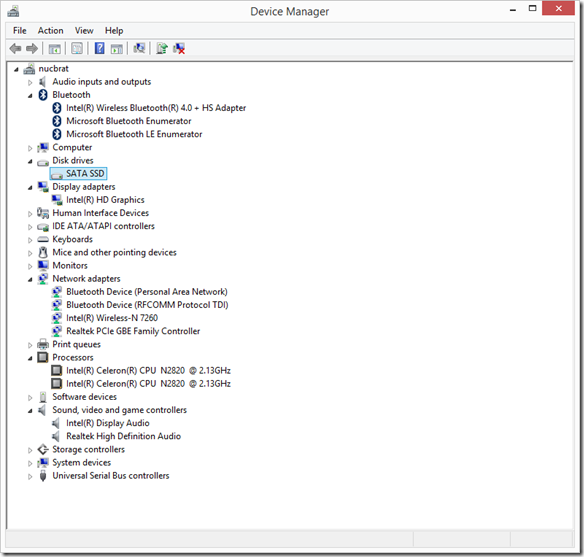 Baytrail is for entry level low power devices running Android and Windows 8. The Acer W510, a nice Clovertrail-based Windows tablet has what I call ‘bearable’ Windows performance. 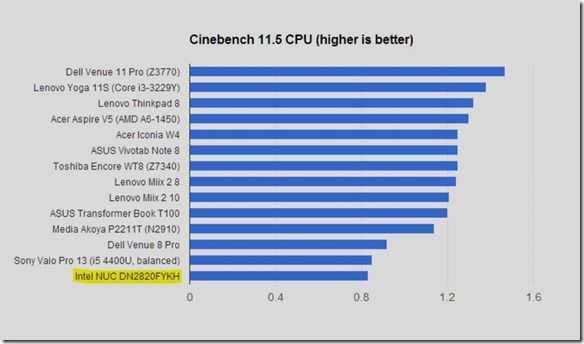 AMD Temash, the quad-core platform for low-cost notebooks has what I call ‘good mainstream’ performance. It looks like BayTrail’s CPU performance will go up to 3X that of the Clovertrail platform and equal that of AMD Temash quad-core. At IDF, which started for me today, we’ll hear a lot more about BayTrail and we expect to see device launches in the next 24-48hours. 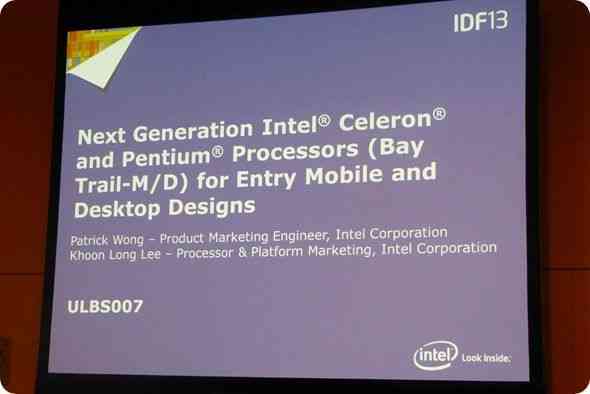 It looks like Pentium and Celeron branding will be used on Atom chips when Baytrail launches. And why not? As Haswell/Core reaches down into sub 10W territory, where Netbooks used to operate, and Baytrail reaches up into power bands above where Atom Netbooks were, there’s a big overlap. 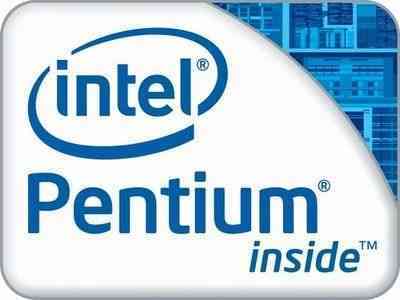 Intel will slap the Pentium and Celeron brands on Atom products. It could be an attempt to re-brand Atom for Windows and Android based devices. 1.7 Ghz Eee PC 900? This must be a typo right? 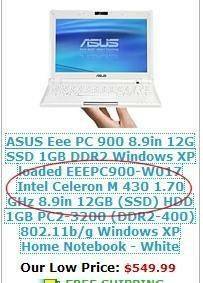 Buy.com are offering an Eee PC 900, SKU EEEPC900-W012X, with a 1.7Ghz Celeron processor. Click the image on the right to see the details. [Buy.com product link.] The same is also appearing at ZipZoomfly. I wonder if this is an attempt to sneak a high-end Eee PC 900 out of the door with Windows XP before the rules change! Thanks, whatever7, for the tip.